So, Sunday nights just got a little bit crowded for me. 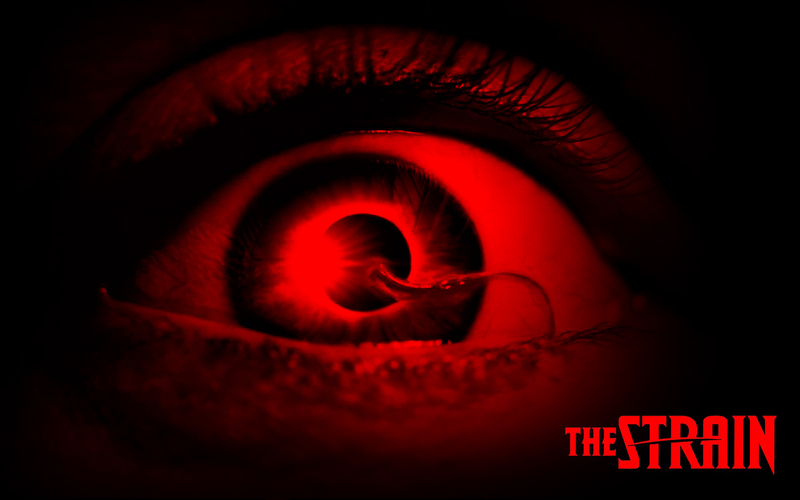 FX’s newest show, The Strain premiered and if I’m being completely honest, I didn’t see this one comin’. With the advent of DVR and fast forward, I barely catch any trailers anymore (something The Maestro has been getting on me about!). Thank goodness I have certain people who catch everything, all the time! Based on the novels by Guillermo del Toro and Chuck Hogan the show takes place in NY and it starts with some mysterious cargo on a plane that lands at JFK airport from Germany. Without giving too much away, let’s call this one an original take on an old story. David Bradley (Game of Thrones Walder Frey) takes a front seat for a change as Abraham Setrakian, a mysterious pawn broker with a questionable past and a VERY questionable pet! He’s trying to help set the Center for Disease Control on the right path, while it’s trying to figure out what the hell is going on there. Oh, and there is also a very strange family of sorts that appears to be calling the shots for all this chaos that definitely sparked my interest. One thing about the pilot too, is that although it clocked in at around ninety minutes it flowed very smoothly and didn’t drag at all. In fact, I couldn’t believe it went as quickly as it did. And it had just the right amount of gore for my taste. With plenty of weird characters, AND Sean Astin, I will definitely continue to tune in to see what happens next. I would suggest you all do the same. Now. I mean it.